For me, Christmas carols are one of the best parts of the holidays. In fact, I’m listening to them on the radio now as I write this post; they have been playing for over two weeks before Thanksgiving! Several years ago, I came across a company that makes “music box” components and surprisingly, they have excellent tone quality. I’ve made several music boxes with my 3-dimensional flowers on them and I thought that this project would be a personal one I could give away. 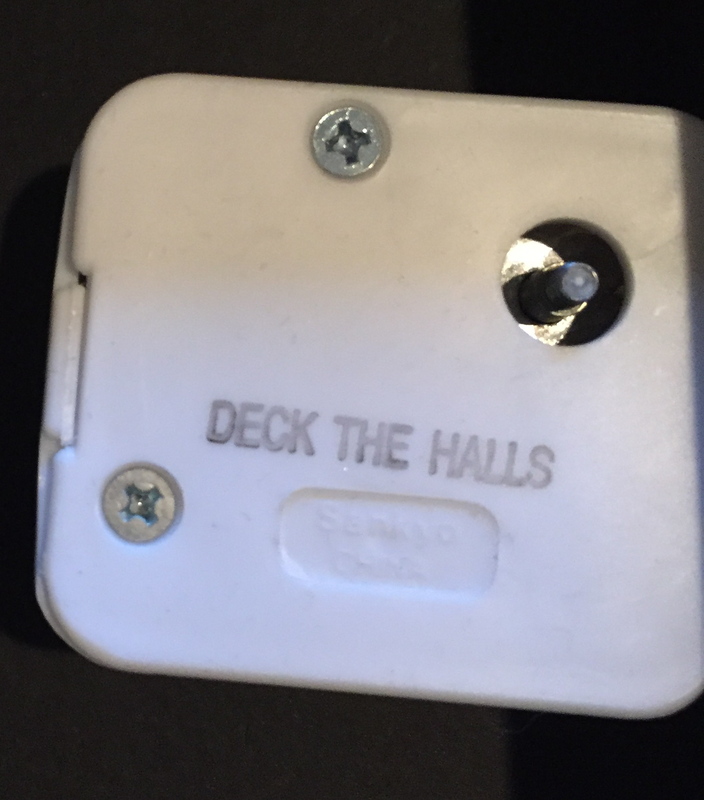 The music box plays Deck the Halls, a Welsh melody that dates back to the sixteenth century. It’s a traditional yuletide carol and one I can remember singing in the choir when I was younger. 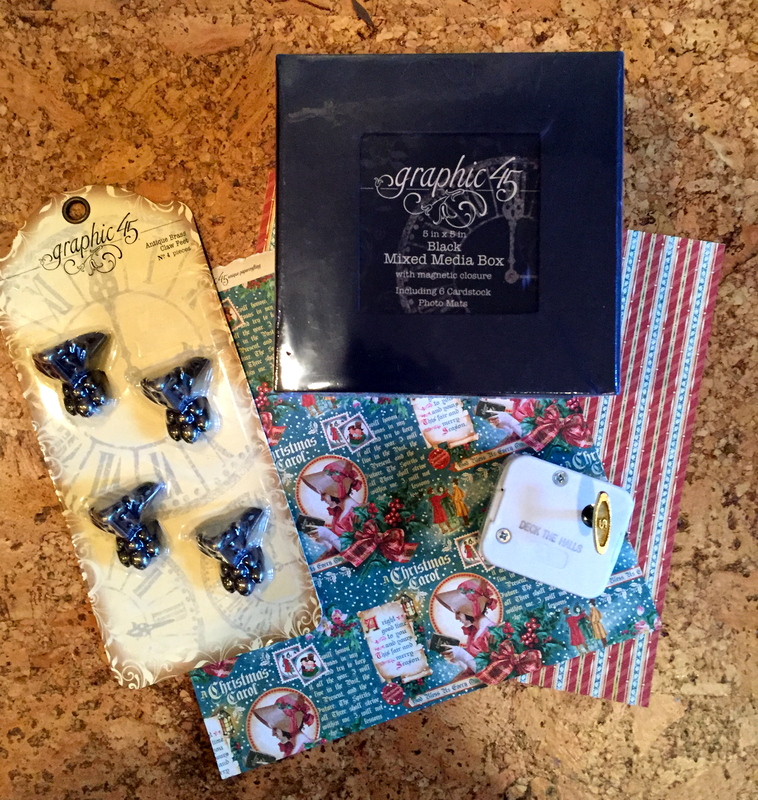 To win this keepsake plus the Garden Notes Poinsettia and White Pine Pinecone & Bough dies, make a comment about your favorite carol and why it’s a memory. The winner will be chosen randomly at the end of the week. 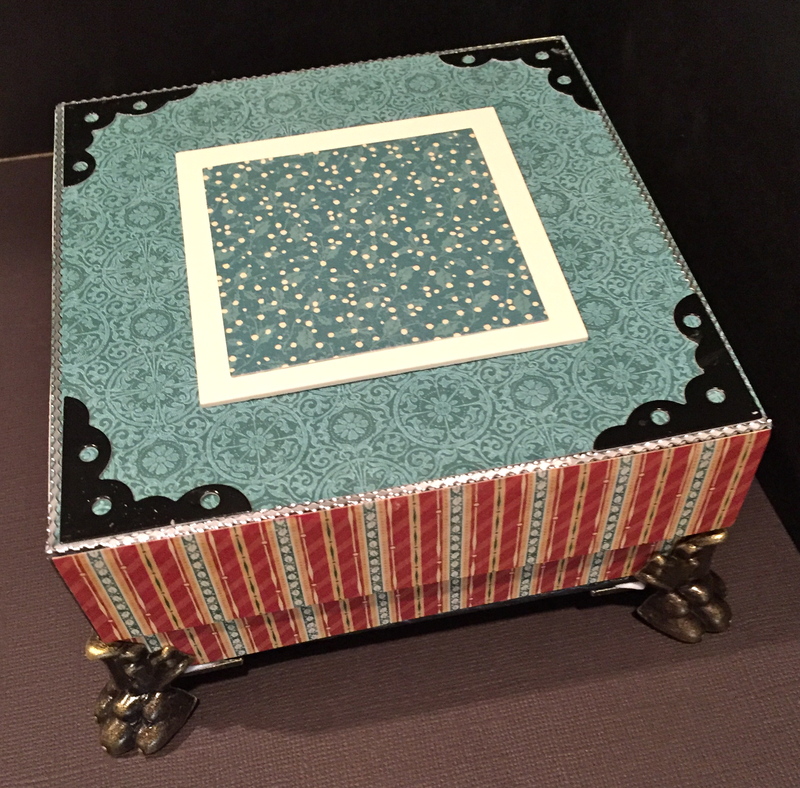 I like using Graphic 45’s Mixed Media box (#4500983) with their Antique Brass Claw Feet (#4501027). You need to use the feet because there has to be space for the “key” to the music box underneath. 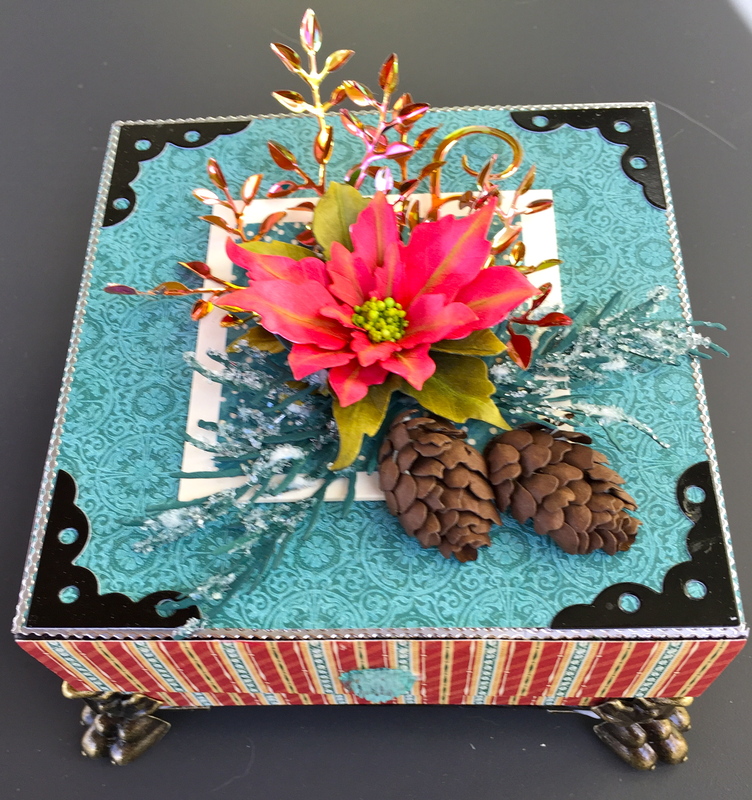 I also chose papers from their “A Christmas Carol” collection to cover the box, using “YES” glue. 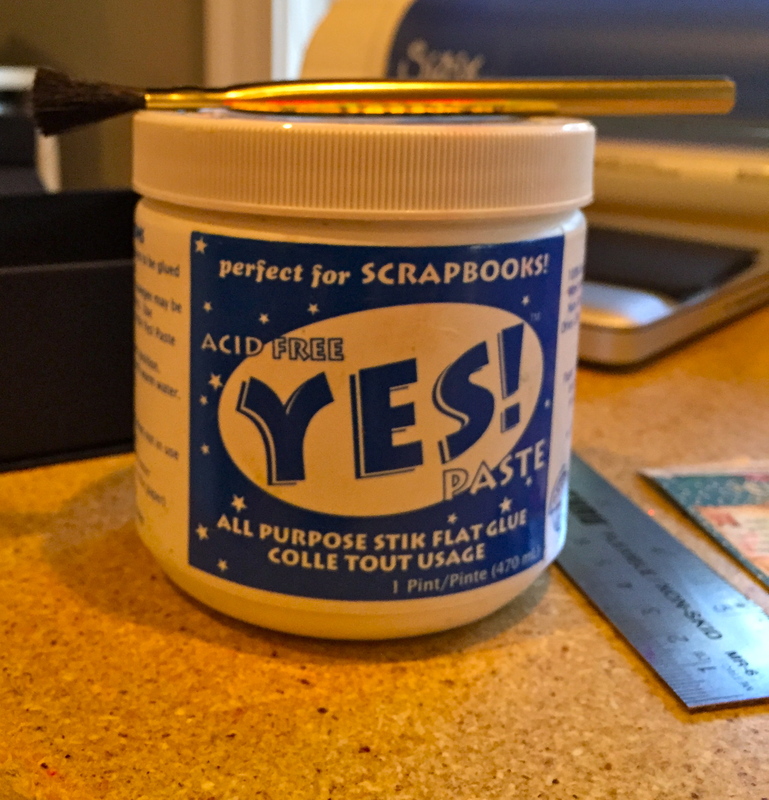 This glue can be found at most craft stores and since it doesn’t dry quickly, it’s easy to maneuver the papers in place. If you are covering the box, do it first before adding the claw feet. Inserting the music box component. I dabbed a bit of white paint on the post and mark the hole inside the Mixed Media box. 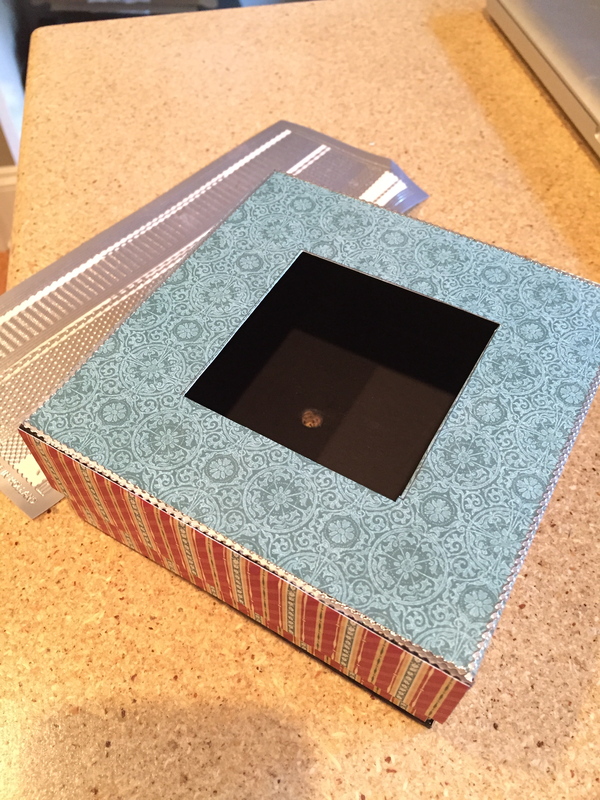 Since this box is very sturdy, I used my drill with a bit compatible to what I wanted the opening to end up to. Once the hole was drilled, I applied Crafter’s Pick Ultimate Glue on the bottom of the music box component and set it in place. Allow this to dry about 30 minutes before starting on adhering the Claw Feet. 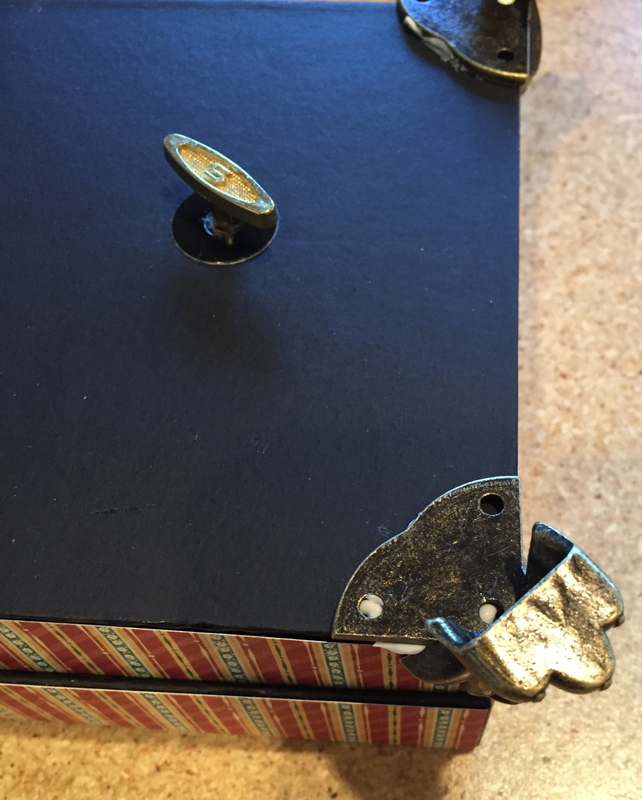 I used the same glue to attach the Feet to the bottom of the box, then screwed in the key to the music box component. To finish it off…I added corners from Els Van de Burgt Studio Fitted Frames 1/Lace Rectangles (#1061) corners in black glossy card stock and Peel-Offs in Silver (#1016) around the box edges. The Poinsettia (#1090) was die cut in Soft-finish card stock and colored with Copic Markers: green leaves–YG97, YG95, and YG93; red leaves–R29 and R46. A last touch, I add Prills in Ribbit to the center of the Poinsettia to create the bracts. I die cut the pine cones in 80lb brown card stock and the boughs in 80lb dark green, then added Diamond Dust for a snowy-look. I love the Carols too. Hark The Herald Angels Sing, is my favorite, because on Christmas when I was 9 , I received as a Gift from Santa, an Angel that also had a music box inside it with that song. The Angel is nothing really fancy, just a White Felt Cone (the music box inside it) with a Head, Halo, Wire Wings with White netting. I still have it 45 years later, and it entitled to the Prime spot on my Dining table. Whatever center piece I have the florist arrange, has to have a place for me to put her. Keep those musical notes in the air. Oh! I haven’t thought about my favorite “Bring a Torch, Jeanette Isabella” in so many years, until your post brought it back. Now I’m looking for a recording. I love it because my mother, who was one of the “Mother Singers” choir in Berkeley,had a solo part for one Christmas when I was maybe 5, and she practiced it frequently. I remember being allowed to attend the recital, dressed up in a green taffeta party dress that she had made for the occasion, and I had a white rabbit’s fur muff (remember muffs?) that was SO soft. It’s funny how we associate our memories, isn’t it…how I miss my mother’s voice!!! I have many favorite Christmas Carols but the one that comes to mind is Silent night . My grandmother had a piano and all my Aunts and Uncles would stand around the piano and sing, I could barely see the keys but it was so much fun listening to them harmonize and seeing the smiles on their faces. It was such a great memory of my childhood, We lived in the Mountains of North Carolina and often had snow on the ground in those days, Waited so patiently for Santa to come and that year I got a little suitcase with a doll in it, It might as well have been the most expensive toy in the world . There is nothing more special than our childhood memories of family at Christmas..
One of my favorite carols is ‘It Came Upon A Midnight Clear’. It was the first one I learned to play on the piano and everytime my Granddad came to visit he wanted me to play it for him. (Even when it wasn’t Christmas.) He didn’t care if I made some mistakes, he always told me it was perfect and made him smile. My all time favorite carol is “Angels from the Realms of Glory”. It was my Grandmother’s favorite and one year, when I was about 12 I decided to surprise her with a recital of it during our church midnight service on Christmas Eve. I got the choir instructor to help me and I practiced all year. My Grandmother was the church’s primary organist so keeping this secret till the last possible minute was hard! When the time came and I stepped forward to sing, I will never forget how surprised and how proud she looked. It became one of our favorite Christmas memories. I think of my Grandmother and that magical midnight service almost every time I hear this carol.